Pet Magasin is a number-one-rated retractable do leash with a stylish ribbon-style design that lasts long. It is ergonomic, does not burn nor irritate the skin, and a well-designed system that retracts smoothly when it is in use. 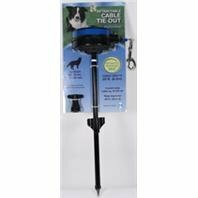 This way, you can control how far your dog can run for an enjoyable training and walking experience. You also gain better lateral and directional control without sacrificing comfort of impeding your dog’s movement. Out of the box, Pet Magasin ships ready to use. It works tangle-free, extends up to 13.5 feet, and supports up to 44 pounds. If you buy an original accessory for a reputable offline or web store, you also get a 100% money back guarantee and a two-year warranty. 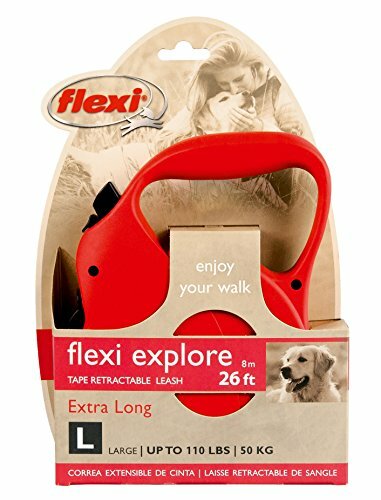 Flexi is a German-made retractable belt that is deal for training and walking small and large dogs weighing up to 26 pound. It is light yet durable, extends up to 16 feet when in use, and has a reflective highway-grade reflective sheeting that improves visibility in the dark. This way, as you trail, run, and or walk with your dog at night, the risk of an on-coming motor vehicle running him or her over diminishes significantly. Its black and neon yellow is eye-catching. Its mechanical system retracts fast and smoothly, while the limited manufacturer’s warranty offered is testament of its high quality. Other features that user consider invaluable are its ergonomic handle, lock button, and its safety collar. Do you explore open and or bushy terrain with your dog often? 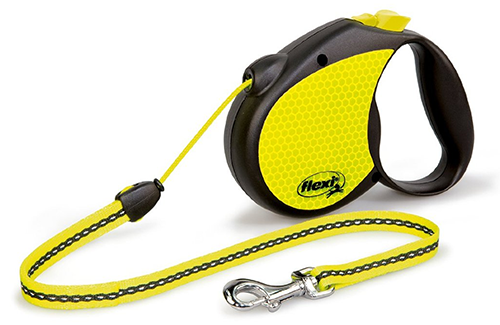 If you are looking for a replaceable retractable dog leash that is ideal for such activities, Explore retractable dog leash by Flexi is one of the best product around. This German-made accessory is light and easy to use. Its ergonomic handle maximizes comfort. Its 26-feet retractable leash offers superior forward and directional control, while the sturdy material used to make it supports small and large breed dogs weighing up to 110 pounds. For just a few dollars, you also get a patented recoil system for faster and better control, a patented handle-integrated one-hand braking system that works well, and a limited lifetime warranty. Designed for walking two dogs at the same time, Wigzi is an innovative dual retractable leash that supports 35 pounds per dog. Each leash is tangle-free and extends up to 10-inches. This is interesting, considering the challenging experience many people face while walking two dogs. Even with its intricate design and innovative features, Wigzi Dual Doggie retractable leash is surprisingly easy to use. It is also durable, ergonomic, and has a color-coded braking system that works reliably. Storing and transporting Flexi dog leashes is an arduous task that most dog owners do on a daily basis. 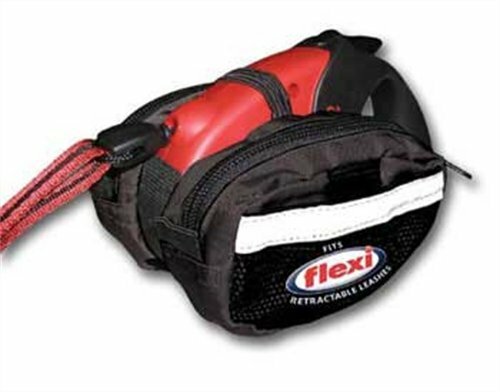 While most people dump their accessories in cupboards for storage or under vehicle seats during transportation, this black Flexi Leash accessory bag is one of the best products to use. It is light, highly portable, and has four roomy pockets for storing your retractable leash and other dog and or personal accessories. 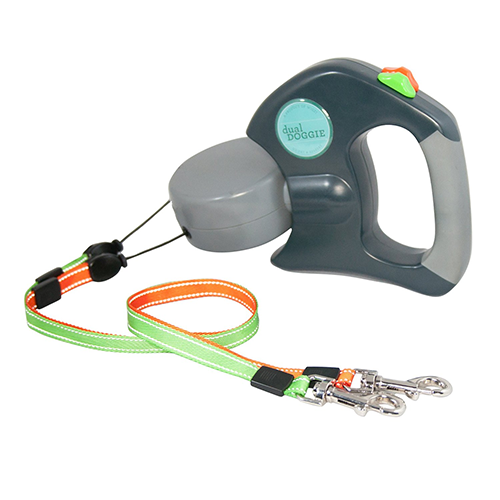 It is easy to attach, fits most Flexi retractable leashes, and is made of a durable fabric. 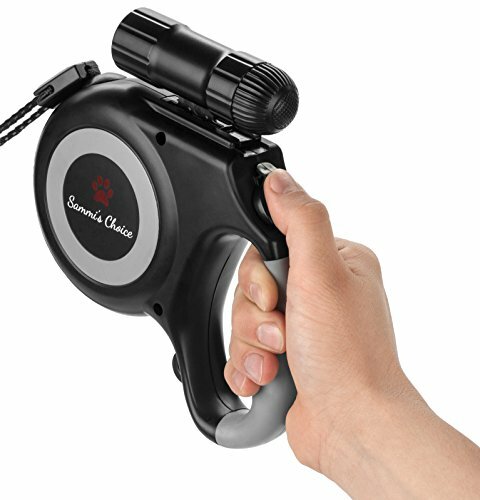 Favored in several top 10 best retractable dog leashes reviews shared online, Quirk & Ferg is a functional 8-foot dog leash made of durable nylon. It has soft padded handles for maximum comfort when training and or walking dogs for long; a dual handle design for better control of large and or aggressive breeds of dogs; and a comfortable collar that fits securely without irritating the dog’s skin. If your dog tags often and or safety is of primary concern, this leash works well. It is affordable and easy to use. 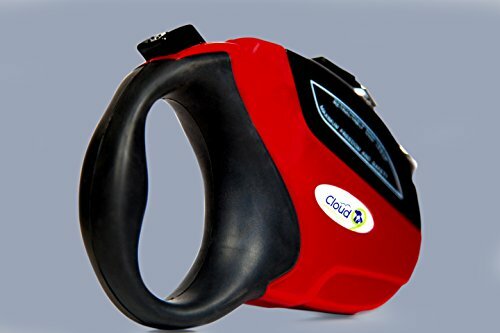 Ideal for running, walking, and training, Cloud 9 is a well-built retractable dog leash for restraining small, medium, and large dogs weighing up to 110 pounds. It has a durable and flexible nylon leash that extends up to 16 feet. 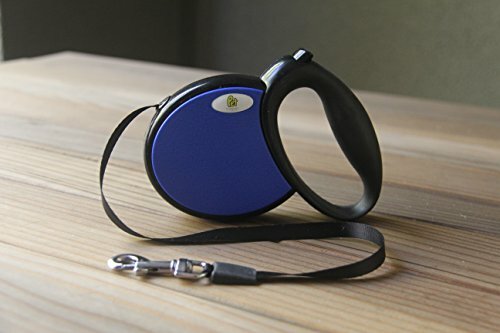 It also has a comfortable/ ergonomic design that gives users full control over dogs, an easy-to-use push button lock for maintaining training or walking distance, and a tangle-free design that allows dogs to run or move smoothly without tripping. 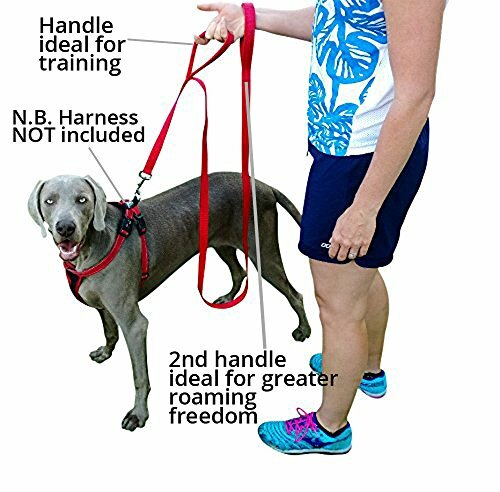 In addition to this well-made retractable leash, you also get a free eBook with top training leash, nutritional, and dog management tips. Lixit by Lixit Animal Care is a medium-sized retractable cable tie out that stores cable neatly until they are ready to use. It mounts solidly on the ground, rotates on a 360-degree axis to offer maximum play area, and has a reflective reel for better visibility, particularly when your dog is playing at night. This cable tie out is light, portable, and ideal for home use and regular travel. Its patented retractable tie works smoothly, while its affordability and low maintenance design makes it an ideal everyday accessory. A best seller in many stores, Sammi’s Choice is a number-one-rated retractable dog leash, ideal for restraining small to medium size dogs. It fits safely and securely, has a bright and detachable LED flashlight for better visibility at night, and comes backed by a 100% money back guarantee, which reflects its high quality. As many leashes reviewed here in, Sammi’s Choice is built to last. Its sturdy casing is impact resistant. It is also eco-friendly, designed for better control, and has an ergonomic rubber grip handle that stays comfortable for long. This leash supports one-handed operation. It is pet safe, has a jam-free cord retention system, and responsive instant brake and cord locking system. 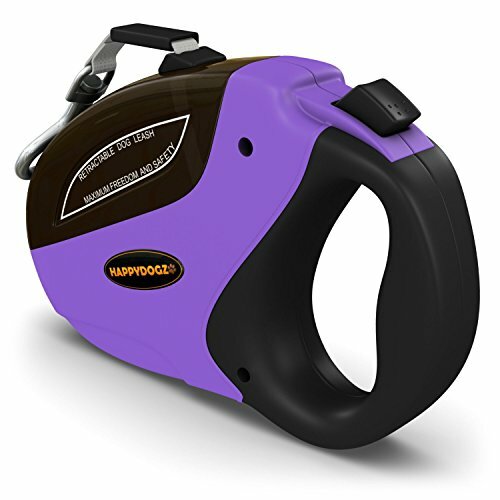 This comfortable and ergonomic retractable dog leash by HappyDogz is our pick for the best in 2015. It is sturdy, features a heavy-duty leash, and has a fast and reliable leash retraction system that gives users full control of dogs while training or walking. At full capacity, this leash extends to up to 16 inches. It is certified safe and secure, ideal for small dogs weighing up to 44 pounds, and comes backed by a 10-year limited guarantee.